Maori people protesting in central Auckland, New Zealand, against the sale of their land and assets. 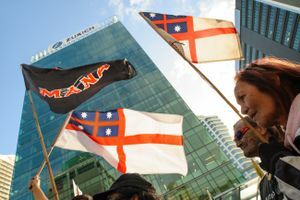 The United Tribes of New Zealand's flag (and a political party one) is flown in front of buildings in Auckland's financial district. HIKOI in the Maori language ( New Zealand) means 'step'. 'hike' or 'march' and, by extension, a protest march. A Hikoi is usually a long journey taking days or weeks.